A prospective student often asks, “what are the benefits of training?” A generic answer at this juncture of the conversation of course would suffice the inquiry, however there is nothing generic about Scranton MMA or the way we feel about martial arts training. In truth, the benefits will vary from individual to individual so we asked Scranton MMA instructor Jeff Reese to relate some of his personal experience with regards to training in the martial arts. “I’d like to start by saying I am no martial arts expert, and while I am of course bias and feel Gracie Jiu Jitsu is the most complete martial art on the planet, I believe the pursuit of any martial art is a worthwhile endeavor. With regards to the question at hand, the benefits for me have been life changing! Let me begin with how I got my start in the martial arts and then relate the benefits. “My first introduction to the martial arts came at the age of six with wrestling. While most people don’t associate wrestling as a martial art it certainly fits the criteria. Of course back then I didn’t view it as martial training, it was just fun. I enjoyed training for the sake of training. That always stuck with me. “Fast forward a couple decades to my sophomore year at college. I was caught up in the party scene and had dismissed wrestling as a childhood memory. I remember that semester watching UFC I, the ultimate test of martial art style versus martial art style. I saw Royce Gracie enter the octagon for the first time and thought to myself ‘Oh man, this kid is gonna get killed. We are about to witness the first televised death!“ Of course I was wrong and like the rest of the world shocked at the ease with which Royce defeated every opponent by using Gracie Jiu Jitsu. During the remainder of my time in college I got grossly out of shape and UFC 2, 3, 4, and 5 aired with this skinny Brazilian repeating his performance over and over! “Post college I returned to Scranton, PA and while flipping through the yellow pages for a restaurant from which to order myself one meal closer to an early grave I hit the M’s and martial arts training and here was this tiny add that leapt off the page reading ‘Learn Gracie Jiu Jitsu”. My first thought was ‘no way’ but intrigued I called the number. Turns out 2 local brothers were friends with Royce and had been training with him for a few years. They told me I was welcome to come by, meet Royce, and train. I was blown away when 72 hours later I met Royce Gracie and had my first lesson! “I trained for a few months and immediately started to see the benefits of this training. Mostly in my waistline; I was 199 pounds the day I first stepped onto the jiu jitsu mats. I wrestled my senior year of school at 135 pounds! Weight loss, discipline, a happier demeanor, confidence, flexibility, and so many more intangibles. After my first six months I was hooked, and let me preface this next comment by saying I do not recommend this course of action to anyone, took a drastic measure to be able to train more and more. I quit my job and began traveling to seminars all over the east coast. My poor parents nearly had strokes! 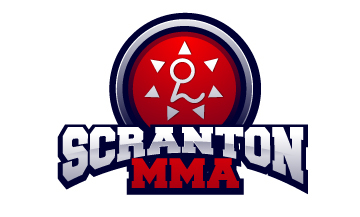 Thank God it worked out for the best and now Scranton MMA is what it is today!? “My journey into Gracie Jiu Jitsu rekindle my love of wrestling and I was able to begin training that anew. In addition, at the nudging of Royce I also began to study Judo. The three arts truly rounded out my over all martial arts experience. Now in 2011 I have the experience of over 30 years of wrestling and have earned my brown belt in both Gracie Jiu Jitsu and Judo. “For me the martial arts are about discipline, community, training your mind, and strengthening your body. This isn’t my lifestyle it’s my life. Wrestling is my flesh and organs, Judo my bones, and Gracie Jiu Jitsu my soul. Jeff’s journey is of course only one of millions world wide, become part of the martial arts movement and benefit for yourself from the experience. See you on the mats!